And it's a home run! The shiny, new cover for Audrey Vernick's SCREAMING AT THE UMP is all we could hope for and more. For the more look at that wonderful blurb from Gary Schmidt on the cover! We love it! The bright and sunny cover reveal for the day: K.A. Holt's RHYME SCHEMER, a poignant and moving middle-grade verse novel that will knock your socks off! Available Fall 2014! Raise the red curtains and kick up your heels because here's the cover reveal for Jeannie Mobley's newest book SEARCHING FOR SILVERHEELS! Isn't it beautiful? We think so! Congratulations to Jeannie and Margaret K. McElderry Books! Book 2 for Natalie Lorenzi! Wow, right? But even beyond that were the loving blog reviews from teachers and kids, saying how much they adored the dual protagonists of Hiroshi and Susan, and the multiple mentions that there aren't enough books that portray a contemporary immigrant experience for kids, or show modern cultural diversity in such an honest way. Well, we hope those readers will be as happy as we are that the story in FLYING THE DRAGON will be expanded on with a companion novel, SOMEPLACE LIKE HOME, which will follow the journey of Ravi, Hiroshi's friend from ESL class. Ravi's journey begins in Pakistan, as he and his mother and sister leave to live in the United States, not knowing if Ravi's father will ever be able to join them--Pakistani officials have taken him into custody for reasons Ravi does not understand. Ravi adapts to a new country and a new school, and meets his friend Hiroshi, all with the worry about his father permeating his days. While Hiroshi's story had kite-making and kite-fighting woven through it, Ravi's will be filled with the love of his favorite sport back home, cricket, and the one that replaces it in the U.S.: baseball. We are so pleased that Julie Ham at Charlesbridge has stepped up to bring this one on board after Natalie's editor for FLYING THE DRAGON, left to become an agent. Huge congratulations, Natalie! Deborah Underwood's HERE COMES THE EASTER CAT comes out next week, and it's already got two starred reviews, some very cool marketing swag, a special mailing from Penguin, and tons of excitement behind it--not to mention a sequel, HERE COMES SANTA CAT, coming out this fall. So it's probably no surprise to learn that a THIRD story starring the cheeky Cat is now underway! Peter Salomon's chilling ALL THESE BROKEN ANGELS drops in Fall 2014, and it's going to be amazing. Don't miss it! Corinne Duyvis' new cover is here and it's GORGEOUS! Otherbound will be available by Amulet/Abrams Books in June 2014. We can't wait! Maria Gianferrari's got a brand new DOG! Have you meet Moose? She is a dog you will want to have on your radar. She's also the show-stealing character in Maria Gianferrari's poignant picture book, HELLO GOODBYE DOG. The story follows wheelchair-bound Zara, whose best friend Moose keeps sneaking out of the house and trying to join her at school. After Moose has to be repeatedly brought home, to her increasing distress, Zara finally comes up with an excellent plan so she and her friend can be together every day. Take my word for it: This simple story will steal your heart. I know, because it's already won the hearts of a whole lot of early readers—including Roaring Brook editor extraordinaire Emily Feinberg. She is just as batty over Moose and Zara as we are, and I'm thrilled to say that HELLO GOODBYE DOG has found its perfect home on the Roaring Brook list. Let's all give three cheers for Maria and this wonderful new book-to-be! Pat Zietlow Miller welcomes more SOPHIE! 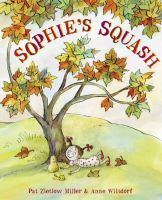 Readers all over the country have not been able to get enough of SOPHIE'S SQUASH. Since the book was published last summer, it has garnered widespread accolades, including starred reviews from Publishers Weekly, Kirkus, Booklist and School Library Journal; an Amazon "Best of the Month" selection; an SLJ Best Books of 2013 choice; and a Booklist Books for Young 2013 Editor's Choice—to name just a few. So if you are one of those readers who is craving more Sophie (and more squash), you will be very happy to hear this news: There is more SOPHIE on the way! Anne Schwartz of Schwartz & Wade has just signed up a picture book sequel, currently titled SOPHIE'S SEEDS. In this charming follow-up, young Sophie heads off to school and explores a completely different side of friendship—with results both humorous and heart-warming. What could be better? Gosh, we were thrilled this year to hear the news that Joanne Rocklin's THE FIVE LIVES OF OUR CAT ZOOK won the Golden Kite for Fiction--the highest award that children's authors give to fellow children's authors! And I was thrilled to get to attend the awards ceremony in August in Los Angeles, where I got to hear Joanne give a funny and warm acceptance speech. And yet, somehow, we never shouted about the news here on the EMLA website! How the heck did we manage that? It's no matter--we're shouting it now, and it's actually kind of timely, as Joanne was invited, as a Golden Kite honoree, to go to the nation of Qatar in December, and there is now a post about it on the SCBWI website. Isn't it thrilling, the idea of going to Qatar to talk about children's books in general and your books in particular? I'm so pleased Joanne had this opportunity! Congratulations, Joanne! Tara Lazar's Starting the Year Off Right! Boy, that Tara Lazar is one busy lady! You might know her iconic, hilarious picture book THE MONSTORE, which came out this summer. You might know her as the creator of PiBoIdMo (Picture Book Idea Month), an event she hosts every November that's attended by thousands of writers all over the world. You might also be a fan of her fabulous and insightful writing blog. THE MONSTORE author and PiBoIdMo creator Tara Lazar's 7 ATE 9, a pun-packed, preschool noir mystery, starring a hard-boiled Private "I" and a mysteriously missing number, to Kevin Lewis at Disney-Hyperion, by Ammi-Joan Paquette at Erin Murphy Literary Agency (World). Kevin Lewis is already in talks with a top-notch illustrator, so hopefully we'll have some more exciting news to announce on that front very soon. Meanwhile, though, let's bring our hands together for Tara on this super-awesome deal. No, we're not being defensive--believe it or not, that word signals a celebration--the first deal announcement of the new year! Donna Bowman Bratton's EN GARDE! ABRAHAM LINCOLN'S DUELING WORDS, about a little-known naughty episode in Abraham Lincoln's early life that shows he was witty and yet (gasp!) fallible--and how his inventiveness saved his life and helped shape the man he would become, to Kathy Landwehr at Peachtree, by Erin Murphy of Erin Murphy Literary Agency (world). We love these little-known episodes and what they illuminate about well-known historical figures. Huge congratulations, Donna! Welcome, January 2014 New Releases! THE DIRT DIARY by Anna Staniszewski, about a fourteen year old girl who joins up with her mom's house-cleaning business, only to find herself inside the homes of the most popular kids in school--and stumbling across their secrets. Published by Sourcebooks. Available January 7th. FRAGILE SPIRITS by Mary Lindsey, the anticipated sequel to Shattered Souls and a thrilling romance filled with ghosts, rebellion and revenge. Don't miss it! Due out January 23rd by Philomel Books. DIVIDED WE FALL by Trent Reedy, the story of a near-future America which teeters on the edge of internal unrest, and then goes cataclysmically over the edge. Published by Arthur A. Levine Books and hitting shelves January 28th. HERE COMES THE EASTER CAT by Deborah Underwood, introducing the cat with a sparkly suit, a shiny red motorcycle, and one burning desire: to take LOTS of naps. Sorry--that's not right. What was it, Cat? Oh yes--got it. One burning desire: TO TAKE OVER EASTER. Published by Dial Books on January 28th. As always, we wish these books into the hearts of readers everywhere! Easter Cat is seeing STARS! Easter Cat is seeing stars twice over this week! 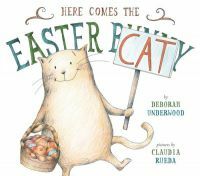 That's right, TWO starred reviews for Here Comes Easter Cat by Deborah Underwood! 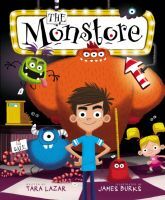 From School Library Journal: "This is a book that will be enjoyed in story times as well as one-on-one. The wonderful ink-and-color pencil illustrations depict the characters' expressions perfectly, enabling children to decipher what is happening even without the narrative. The combination of witty text, plentiful white space, and brilliant images make this a truly winning book, especially for libraries looking to expand their Easter collections." From The Bulletin of the Center for Children's Books: "In each spread, Underwood's streamlined text, humorous in its slightly parental tone, faces Rueda's ink and colored pencil drawings....Cat's signs and facial expressions are cheekily amusing....Pair this with Shea's Unicorn Thinks He's Pretty Great for a silly story session about jealousy, add it to an Easter or cat storytime lineup, or tuck it into a cat-lover's Easter basket." Congratulations, Deborah! It's well deserved praise for one of our favorite, rascally cats!